Despite its generic name, Masters of Anima offers a surprisingly fresh take on action RTS. Exploring a vibrant and varied world, players are invited to control five soldier variants to fight a cartoonish villain. Masters of Anima never takes itself too seriously, with a seam of almost cringe-worthy jokes running through the story and several of the set pieces. It fits well with the bright cartoon atmosphere the game visually depicts, even if it’s not always funny. The fantastic locations, beautiful color palette, and crisp lines make the game stunning to look at with its own unique, timeless style. It might not have the extraordinary vistas of Horizon Zero Dawn with its downward perspective, but it isn’t trying to compete either. Masters of Anima is a game that knows exactly where it limits are, and rarely tries to overdo them. You play as Otto, nothing more than an apprentice magician when disaster strikes. An evil wizard seeks to destroy the world and has stolen your fiancée, a powerful conjurer who might be able to stop his wave of destruction. The premise is definitely nothing ground-breaking but has enough of a spark of originality to keep it interesting. As always in these magically inclined games, the protagonist’s inexperience allows the game to gradually introduce new elements into the gameplay. In this case, these are the golems you use to battle through the ten levels. In the beginning, you’ll be juggling a basic mix of melee and ranged units but towards the end, you’ll be balancing a cast of supporting golems and offensive ones if you want to take on the later bosses. Commanding your small militia is fairly simple on consoles. More than once I forgot buttons prompts and had my army sundered as a result, but I think that was more down to my lapse in attention than the game. 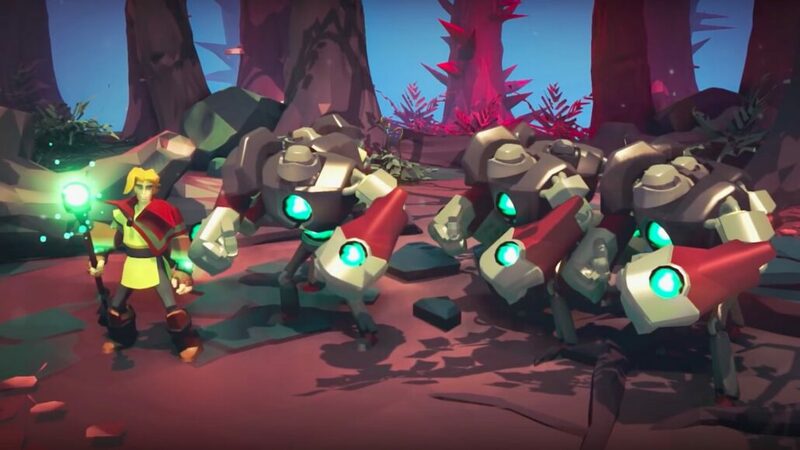 Enemies, which appear as lumbering wild golems telegraph their moves allowing you the opportunity to muster your forces to avoid damage, but battles can become quickly overwhelming. Due to panic I often moved more troops into the line of danger rather than out of it, and when multiple enemies had taken the field I often found myself outflanked and in a lot of trouble. The variety of enemies isn’t huge, but the game uses that to tease out more challenge and skill. Early bosses become more standard enemies and even start appearing in multiples in later stages. This keeps the difficulty curve manageable while letting players feel that awful kind of excitement when you see two of the boss that a few levels earlier nearly killed you. This all helped make Masters of Anima stand out though, forcing me to pay attention and learn some of the depth of the units. I enjoyed defeat nearly as much as a victory since it gave me an urge to try again. That, coupled with the scoring system after each battle, meant I was always tempted to redo levels to beat my previous scores. The time spent between battles can be a little too long, however. These areas allow you to hunt for collectibles and resources but can stretch a bit too long in some cases, even if the areas are nice to look at. That being said, the resource management part of the game can make some of the battles more tiresome than tactical. While there is only one resource in the game, used to create soldiers and activate their special abilities, its acquisition can be a little underwhelming. While some supporting golems can help you farm more, sometimes you are left hopeless running around the battlefield and searching for more juice to summon allies. This makes some defeats less decisive than dull, as you eventually surrender to your unavoidable, but extremely slow fate. When things are going right, though, there’s a real sense of military achievement as you charge between troops, activating abilities and marshaling attack and support lines. Because of your character’s physical presence on the battlefield, you get a real sense of the command as you actually lead your soldiers into war. The scope of battles is never as vast as the likes of Total War, but the microscale lets you control the flow of the battle without ever feeling overwhelmed or unnecessary. When a mistake costs you five melee fighters, you feel it as your support line becomes more exposed. Likewise, the loss of a support soldier can quickly snowball into something quite bad. Masters of Anima is a surprisingly brilliant tactical game set into a pleasantly quaint cartoon. It has a sense of humor and personality that other strategy games don’t even dream of. While its linear levels and skill trees tie the game to more traditional progression, it is a fun and engaging experience. Without ever reaching further than they could grasp, the creators of Masters of Anima have managed to balance an exceeding number of interesting features. Hiccups with controls and pacing can be overlooked when you are rushing to turn the tides against three gigantic monstrosities you couldn’t dream of toppling just a little earlier. Reviewed on PlayStation 4 (code provided by the publisher). You can purchase a digital code for PC via Fanatical.